Those of you who follow me on ETSY, Twitter, and/or Facebook know all about the cute, adorable baby boy accessories called Pee Pee Cones! I was at a small craft fair this weekend and had them displayed with a short explanation of what they were. Not only did they attract the customers - curiosity just got the best of them - but after they read the explanation they broke into smiles, laughed out loud, and all could relate to the problem these Pee Pee Cones solve! It was also interesting watching and listening how parents explained to their curious kids about what they were when asked! 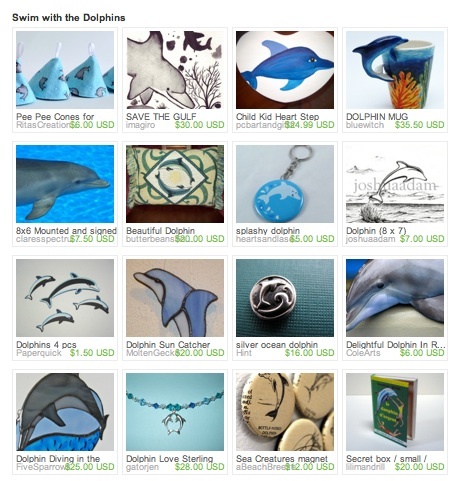 So, to honor all of those smiles, laughs, and explanations, here is a treasury of Dolphins which not only features my Dolphin Pee Pee Cones, but many other dolphins on ETSY too! Hope you enjoyed your swim!! What Happened to the Brownies?